For queries please contact Deirdre Burns, Heritage Officer, Wicklow County Council dburns@wicklowcoco.ie T: 0404 20100. 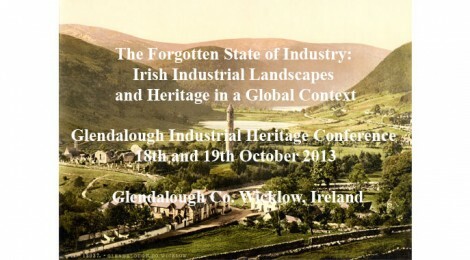 A two day conference looking at Ireland’s industrial heritage is to be held in the Glendalough Hotel, Wicklow, on October 18th and 19th October. Hosted by Wicklow-based group “Glens of Lead”, the conference will bring together a host of international speakers to highlight the significance of industrial heritage in Ireland – including Wicklow – and to offer the opportunity to share international best practice in the conservation, management and presentation of this heritage. The remains of historic mines, factories, mills, shipyards, canals and railways are scattered across Ireland and are an archive of the workplaces and lives of Irish people, in particular from the 19th century onwards. Traditionally underappreciated and neglected, this conference aims to change perceptions of these ‘worked’ landscapes by showcasing examples from across the world of where industrial heritage has become a major catalyst for social and economic regeneration of local communities through the development of tourism and pride of place. The event, titled “The Forgotten State of Industry: Irish Industrial Landscapes and Heritage in a Global Context” is part of “Metal Links”, an EU funded project which seeks to promote joint opportunities for former metal mining communities in Ireland and Wales to increase the appreciation, protection and management of historical industrial landscapes. The Conference will be officially opened by Minister for Arts, Heritage and the Gaeltacht, Mr Jimmy Deenihan TD, and will feature speakers and audiences from across Ireland, UK, Europe and Australia. Attendance at the conference is booking up fast, to register for your place visit http://glensoflead.eventbrite.ie/. There are various ticket options available, including one or two day rates, with the opportunity to attend the evening banquet and keynote address by Professor Marilyn Palmer, President for the Association of Industrial Archaeology, UK on Friday 18th October. A special ‘budget’ €25 conference only (no meals) day rate is also available. The Glens of Lead is a community initiative working to improve the understanding and protection of Ireland’s most important historic lead mining centre in the Wicklow Mountains. This event is made possible through funding from the InterReg 4A (Ireland-Wales) ‘Metal Links’: Forging Communities Together project, and is supported by Wicklow County Council, The Heritage Council and The Gathering Ireland.